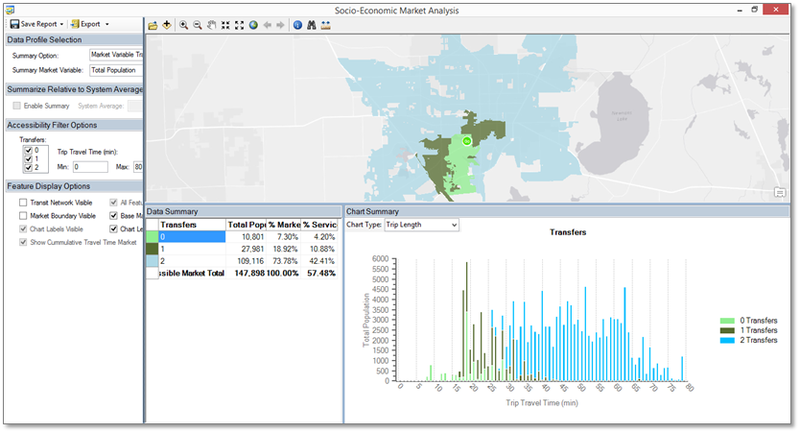 The TBEST Network Accessibility Analysis functionality combines TBEST transit networking origin/destination results with market and model results to produce an interactive summarization of network accessible markets and model output. The core of the accessibility calculation is the TBEST Network Accessibility Build which populates an origin/destination matrix for each stop in the network. With a Network Accessibility Build matrix, the Network Analysis functionality can summarize both outflow and inflow from a selected stop, multiple stops or from a TBEST Analysis Area. 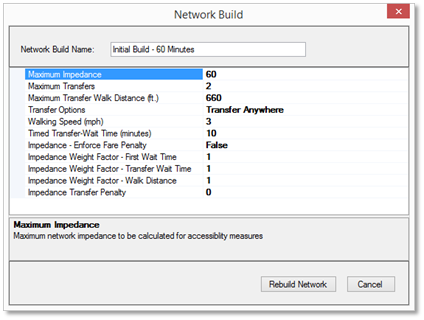 Network Accessibility Builds provide users the ability to define accessibility options such as max number of transfers, max trip time, weighting of wait times and fares, transfer walk distance and locations. Network Builds create stop-to-stop origin/destination impedance matrices for each TBEST time period. The matrix OD pairs are then utilized by the Network Accessibility Analysis tools to visualize network accessible markets. Summarizes network accessible market conditions using the Market Analysis features including the ability to define a walk market capture distance around the accessible stops. 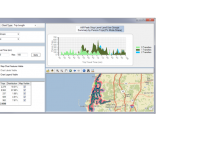 Interact with TBEST model results using the Network Accessible Stop Capture functionality which allows users to summarize origin/destination boardings estimated by TBEST. Within the Network Accessible Market Analysis, filter the accessible features and market summarization by number of transfers or trip travel time. 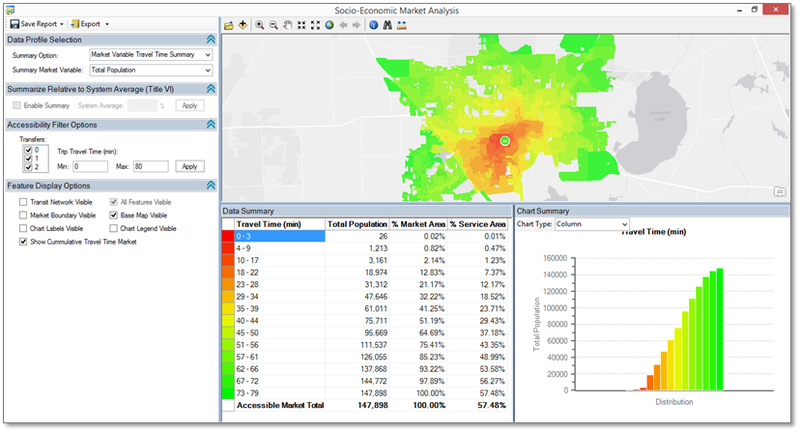 The Network Accessible Market Analysis includes an accessibility summarization chart which interacts with the Market Analysis Map.